Locations of Spine Tumours. 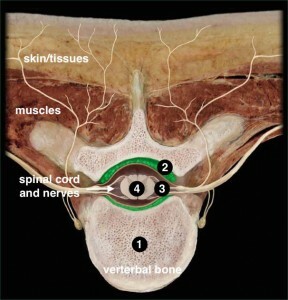 This spine model shows the locations of spine tumours in the bone (1), extradural space (2), intradural extramedullary (3) & intradural intramedullary (4). The spine, spinal cord and spinal nerves can be affected by several different types of spinal tumours. Surgery for spinal tumours is a specialised area of surgery and Dr Ball has expertise in the management of these conditions. Spine tumours can grow in the bones of the spine (vertebral tumours), in the space around the spinal cord and nerves (extradural spinal tumours) or in and around the spinal cord and nerves (intradural spinal cord tumours). Intradural spinal cord tumours can grow outside the spinal cord (extramedullary) or (inside the spinal cord (intramedullary). Vertebral Bone Tumour. A secondary cancer in the vertebral body destroying the bone and pressing towards the spinal cord. Spine tumours may be benign (slow growing/not cancerous) or malignant (faster growing/cancerous). Malignant tumours may be secondary (spread from elsewhere). 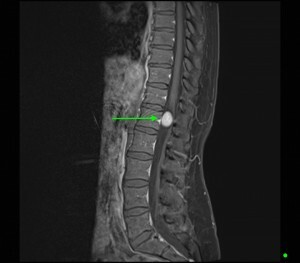 Spine tumours may cause pain, numbness and weakness by compressing on the spinal cord and nerves or from weakening the vertebral bones, in some cases leading to fracture. Click on the different types of tumour to find more out about the tumour and how surgery may help this condition. Intramedullary Spinal Cord Tumour. 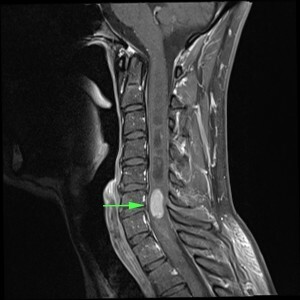 A tumour growing within the cervical spinal cord. This causes symptoms from pressing on the spinal cord from within. Extramedullary Spinal Cord Tumour. 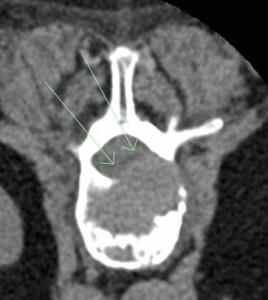 A tumour growing in the space around the lower spinal cord (conus medullaris). This causes symptoms from pressing on the spinal cord.